In small bowl, mix butter, chili sauce and hot pepper sauce. In large bowl, mix chicken and half of the chili sauce mixture. In 10-inch nonstick skillet, cook chicken over medium-high heat 8 to 10 minutes, stirring frequently, until well browned and no longer pink in center. Add remaining half of chili sauce mixture; toss to coat. 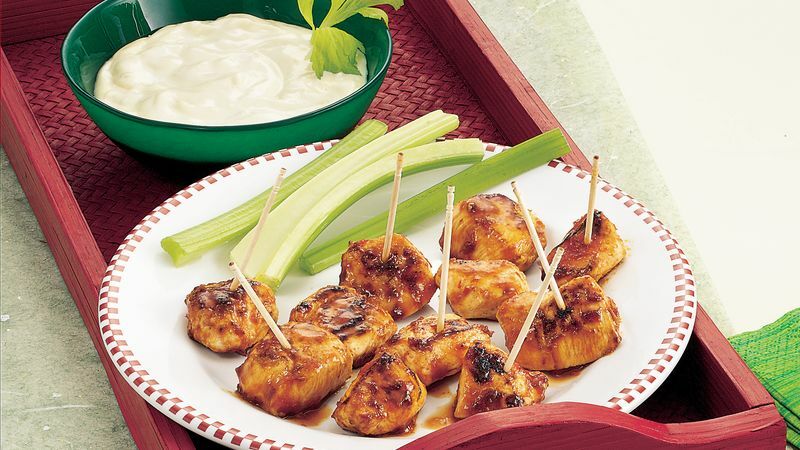 Serve chicken with toothpicks and blue cheese dressing for dipping. Celery sticks are usually served with Buffalo chicken wings to balance the heat from the hot sauce. Arrange celery sticks on the platter with these spicy chicken bites.